The gilder's source for leaf, supplies, tools and materials. Below you'll find access to our family of products presented. Complete product descriptions are included as well as handy conversion tables, helpful hints, and new product announcements. Pricing for all leaf can be obtained by adding the product to the Quote Basket, calling or emailing SeppLeaf Products for a quotation. The Metal Leaf group includes Composition Gold, Aluminum, Copper and Variegated leaf. All metal leaf is intended for indoor use. The copper alloy in metal leaf will tarnish, therefore all metal leaf must be sealed to prevent tarnishing, except Aluminum. Aluminum leaf may get a bit darker in color without a sealer. It is best to wear gloves when handling metal leaf to avoid leaving fingerprints and other residues that may cause the leaf to discolor under the sealer. Cotton gilding gloves are recommended. Metal leaf is sold in units called "packs". Each pack contains 500 pieces of 5-1/2 inch x 5-1/2 inch leaves that covers 100 square feet without waste or overlap. 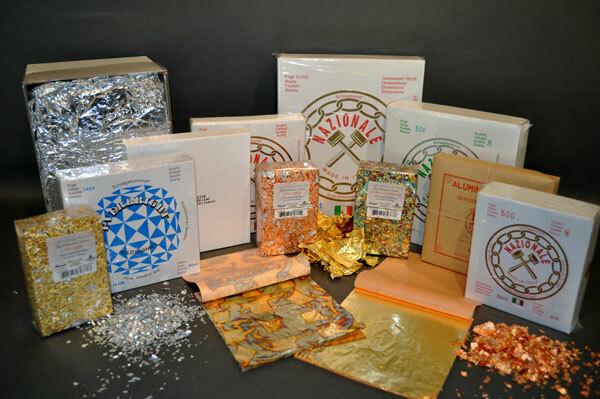 A pack is further divided into 20 "books" with each book containing 25 leaves separated by thin tissue paper. The percentage of waste is based on the complexity of the object and the gilder's expertise in laying leaf. If the surface is very ornate with deep crevices it will take more leaf than the same size area or a flat surface.